St. Dominic was born in Caleruega, Spain in 1170. He studied at the University of Palencia and became a canon in Osma. Canons were priests, who served at a particular church. In 1203, St. Dominic accompanied the Bishop of Osma on a journey through France. During this trip, St. Dominic noticed that the Catholics were following a heretical teaching, the Albigensian heresy, which taught that everything with the created world was evil. The saint was saddened by the number of souls that were being lost through the heresy. In 1206, while St. Dominic prayed on top of a hill in Fanjeux, France, he saw a ball of fire hovering over the town of Prouille. He took this as a sign confirming that he was to start an community of nuns in Prouille to pray for the conversion of souls and for the preaching of the Truth. On December 22, 1216, Pope Honorius III, approved of St. Dominic establishing an Order of Preachers, who will spread the Gospel message through their preaching and holiness of life. Within a year, St. Dominic dispersed his brethren to various areas of the world for the preaching of Gospel. Very little remains of any written documents of the saint; however, the his brethren recall the example of his life. 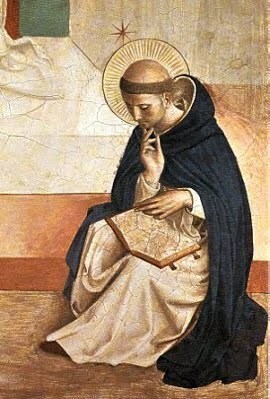 St. Dominic was known by his brethren as he traveled by foot to spread the Gospel, to either speak to God or to speak of God. He sang joyously songs in honor of the Blessed Virgin Mary during his travels. At night, he was know to spend hours in prayer after his brethren were asleep. Before the presence of our Lord, he would weep for the souls of sinners who would not weep for their own sins. At St. Dominic's death, he encouraged his brethren and those who will continue to follow in his footsteps by saying, "Behold, my children, the heritage I leave. Have charity for one another, guard humility, make your treasure out of voluntary poverty."